Dr. Mary De Vera with her younger daughter. It was long thought that arthritis was an old person’s disease. It’s not. It never was. It was long thought that colorectal cancer was an older person’s disease. Dr. Mary De Vera knows first hand that’s not always true either. She’d come far. After being born in the Philippines, she grew up in Prince Rupert. Then did three degrees, ending up with a doctorate. She had a daughter, then another. 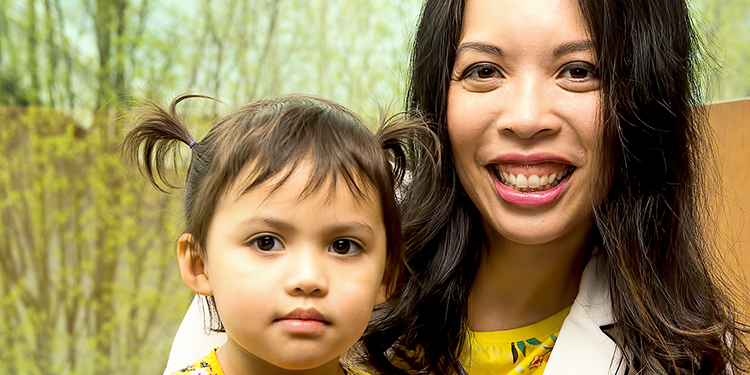 Preparing to return from her second maternity leave to her research job, some of which is with Richmond’s Arthritis Research Canada,De Vera unexpectedly found herself a cancer patient with stage 3 colorectal cancer. Her friends and colleagues kicked into high gear, helping with child care, meals and rides for chemo appointments. There was patient information, but little of it helped someone as young as De Vera. "I have a mountain of brochures at home, but the patients don't look like me. They're much older," De Vera said. "Colorectal cancer is historically thought of as striking in older people. The questions I was asking—about fertility, or how you explain having cancer to a three-year-old—those answers just weren't available." The researcher in her arose. She kept notes of all her questions as she went through the taxing regime of radiation, chemo and surgeries. "I just wanted to get back to work so I could write that first cancer grant," DeVera says. As she healed, De Vera returned to UBC to continue her work and to apply for a grant to bridge the information gap younger colorectal cancer patients encounter. She wanted to demystify the whole process for them. Gathering a team of experts in epidemiology, health economics, cancer and surgery, she applied for and received a $459,000 grant from the Canadian Institutes of Health Research. Now, a few years after her diagnosis, her team’s first goal is to see if De Vera’s early disease is an unusual one-off, or if more adults in their prime have colorectal cancer. She also hopes to create an online resource to answer younger cancer patients’ questions such as, can you bring your kids to chemo or is there a way to store my eggs or sperm so I can have children after my cancer treatment? Her colleague and friend, Dr. Mohsen Sadatsafavi who had spearheaded the online site for helpers during De Vera’s treatment says, "The old saying that what doesn't kill you makes you stronger—Mary really embodies that." A scientific or medical methodologist, like De Vera, is someone who looks at how research is done, designing it so that it is the best and most relevant possible. One of De Vera’s Arthritis Research Canada projects showed that it is safer for women, and their babies, to take most kinds of biologics for arthritis than it is to skip them when they are pregnant. De Vera’s research has had an immediate, powerful impact on the patients it serves. This new project she’s added to her job description promises to do the same. Sadatsafavi, from the office next door to De Vera says: “I'm very excited about what Mary is doing. She has an approach and a vision toward that disease that nobody else has."